UK Furniture Designer Indigo Furniture have launched a Facebook competition which will see one lucky entrant win one of their iconic Lazy Calf Doorstops for simply sharing their Brand Page with friends and family. Indigo Furniture the UK’s leading wooden furniture designer and manufacturer have launched a competition which could see one lucky entrant winning one of Indigo Furniture’s famous Lazy Calf doorstops. The competition launched on the Social Media Network Facebook, requires entrants to simply ‘like’ the brand, enter their details and share the competition with their friends. The competition allows the brand to expand their reach on the social network with the ultimate aim of reaching 2,000 fans at the end of the competition. Social Media is becoming a dominant force in the marketing world and for businesses like Indigo Furniture it is a great way to showcase their unique company and furniture to a whole new audience. Based in Matlock in the Peak District Indigo Furniture design and hand build chunky wooden furniture which has become synonymous with their brand. The furniture company only use wood from environmentally friendly forests and work in partnership with the Woodland Trust to minimise the effect the company has on the environment which provides the resources to make their iconic products. The company originally used only Plank Wood for all of its furniture but released an Oak collection last year after increased demand from customers. 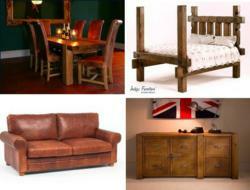 Indigo create furniture for every room in the home including the bedroom, dining room, kitchen and living room which includes a range of vintage style leather sofas. Made from the very best hides from South America and Northern Italy it is from these sofa offcuts that their infamous Lazy Calf Doorstops are made from. Retailing at £49 one lucky Facebook Fan picked at random could win one of the novelty cow shaped doorstops for simply liking the brand page. The terms and conditions for the competition can be found here on their Facebook page and other news and special offers from the furniture company can be found here on their Twitter page. Which is sure to be filled with many more competitions and special offers as more and more Indigo customers find them on Social Networks.